teaching – design – baking – crafting. All to the glory of God. That’s quite a mouthful, and I suppose it ought to be, as my most complex DIY project to date. Remember when I hinted at more projects in the boys’ room? Well, this is it! 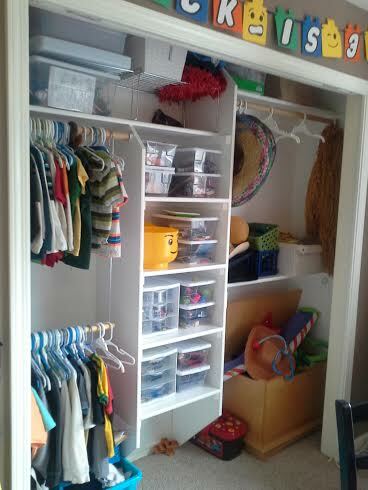 My kids’ new shared bedroom has an enormous closet. The opening is 72″ across. YAY for storage! But BOO on bi-fold closet doors. When open, the doors extend way out into the room, cutting into usable space. The only place for our cozy rocking chair happens to be in a corner by the closet, so with it there, the right hand door wouldn’t open more than a few inches. Scoot chair–open door–retrieve item–close door–scoot chair. A workout, maybe? Functional…Not so much. I’ve been wanting to replace those doors with sliding bypass doors, but I didn’t want to spend a fortune on a new set. 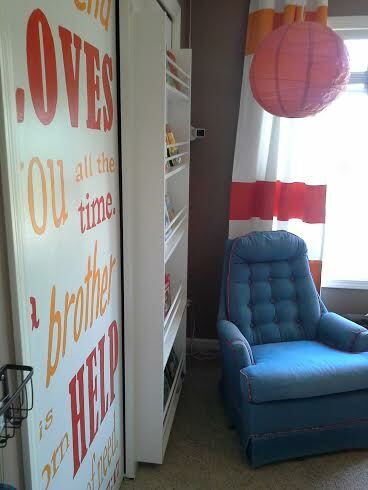 Big fat closet (minus the old doors) – out with the old and on with the new! So, thanks to my trucker friend, the doors made it home in one…er…two pieces. My vision was to build/embellish the fronts, which is another reason why I liked the old flat-faced doors at the ReStore instead of new paneled ones you can get at Home Depot. The right-hand door, the one by our rocking chair, would transform into a sliding, forward-facing bookshelf. 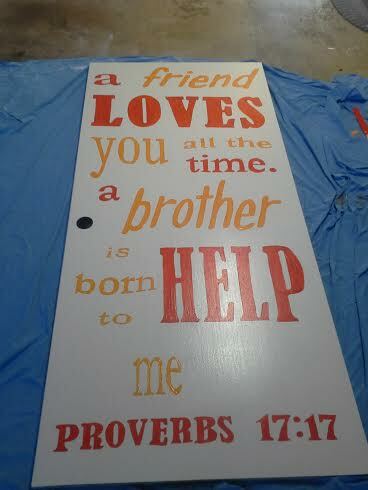 The left-hand door, which would slide behind the right, would receive some custom paint in the form of a scripture verse. Doing this would boost the functionality of the room, while bringing in our two favorite funky colors. When you have a closet taking up a quarter of the wall space, might as well put it to good decorative use! Now, construction time. First step was to sand down the doors and prime them (these were a medium-stain oak, and I wanted white to match our trim). Then, because the bookcase on the right-hand door would cover the pull-cup handle, I filled that hole using a piece of scrap wood, cut with a 2 1/8″ drill bit. 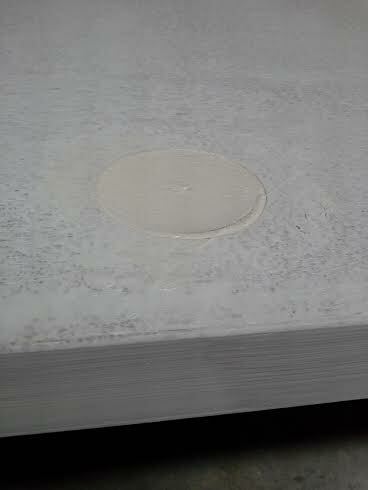 A little all-purpose spackling putty smoothed it off. 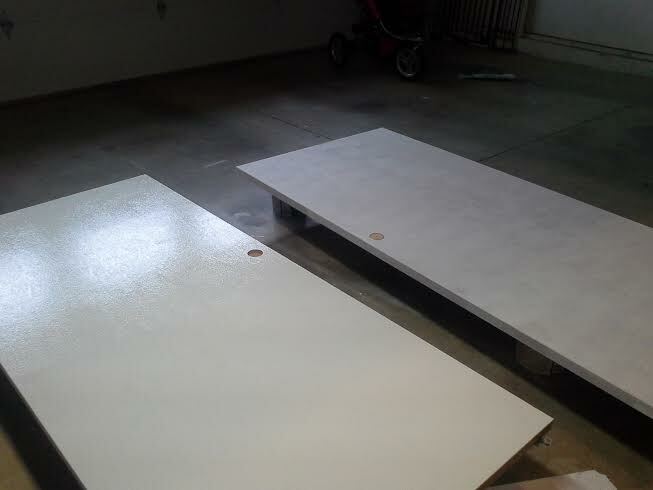 Doors all primed and ready to paint. Note my high tech system for keeping them off the floor to paint the edges. Paint cans. Keepin’ it real folks! Next, paint. I painted all sides of the doors except the front-right, which was about to receive the bookcase treatment. After construction, I painted the entire front of the bookshelf door. 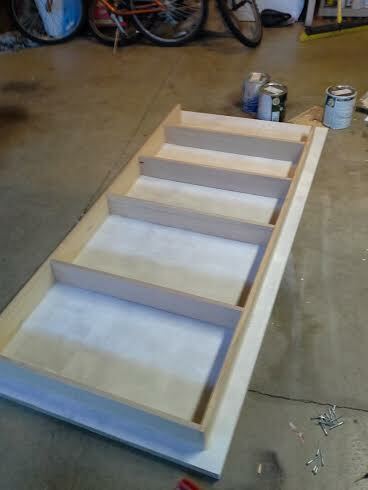 I didn’t bother to prime the shelves, since I wasn’t concerned about paint sticking to bare wood. After a couple coats, I fastened on the previously painted dowels (counter-sink again). I did these one side at a time, which helped get all of them evenly tight on both sides. 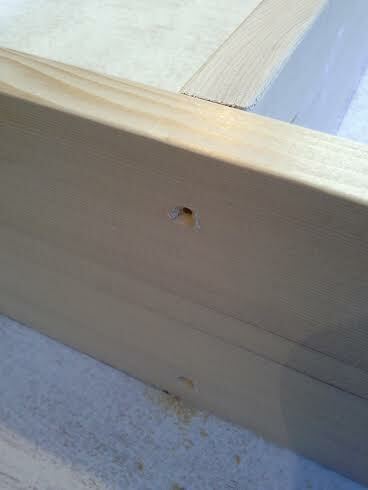 One or two dowels were cut just a smidge too short, so I filled the slight gap on one side with a bit of putty. Gave the whole thing a 0nce-over with touch up paint (cover all those screw heads! 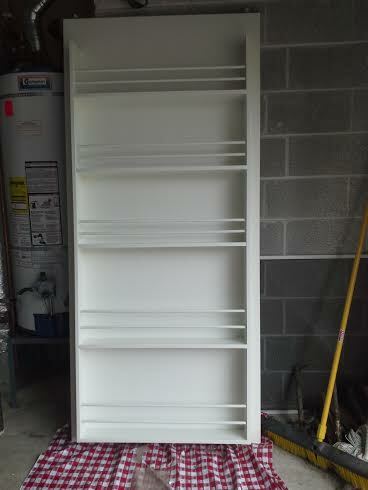 ), and the bookcase door was DONE. 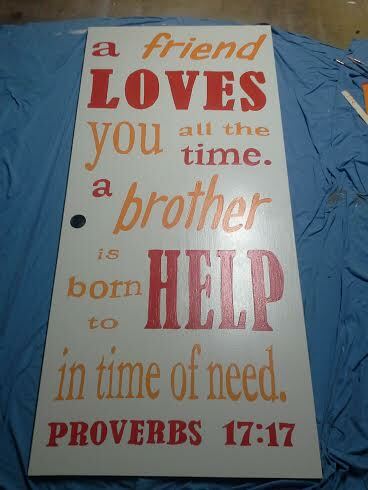 The first coat didn’t come out quite perfect so I did go over it one more time. Then it was *finally* time to hang these doors! After removing the bi-fold doors and hardware, I installed the sliding door tracking. That was simple enough. Getting the doors to slide on their tracks was trickier. First, the bookcase door was FAR heavier than before. I was sweating, panting, and fighting it all the way. Then, to my dismay, once the doors were up I could not budge them at all! As it turns out, they were a quarter inch too long for the opening. BUMMER. Enter our terrific neighbor, Dave, with his circular saw to make all things right with the closet-door world! After Dave trimmed the doors down, they went up without too much fuss and slid nicely. Phew! I don’t have a picture of Dave rescuing me from closet door doom, but I have to give him a shout-out. 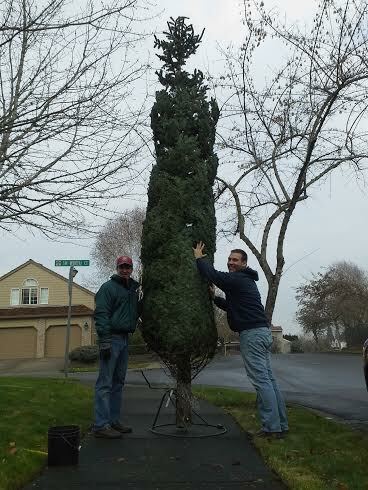 This was taken last Christmas – our annual tradition of begging Dave to help haul the ginormous 14-foot live tree into the entryway. We owe him. A lot. All right, back to the project. 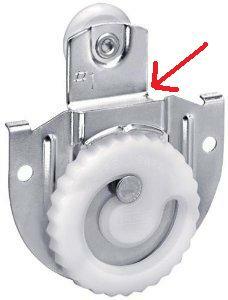 One little thing I learned when installing new sliding door hardware is to pay really close attention to the wheel brackets which go on the top of the doors. I didn’t realize when fastening these on that two of them have a deeper inset, allowing for the front door to slide with just the right distance from the back door. I thought I was going crazy when the doors didn’t budge after I thought I’d gotten everything up just-so. 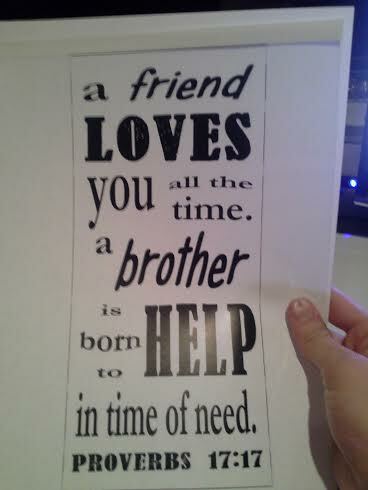 The instruction booklet was not my friend, to say the least. I was so relieved when I finally figured it out! Look closely at the depth of this part when you’re installing the hardware! For those of you patient souls who actually made it to the end of this way-too-long tutorial – here is the finished product! I have a few little finishing touches to complete, now that they’re up and I can see them in action: add trim to the headrail so the tracking is concealed, and add a little lip to the bottom of each shelf so skinny books can’t slide out. But overall I am thrilled with the end result! The boys are loving them too. My soon-to-be-first grader can read the whole verse out loud, which just makes this mama’s heart burst with joy. And, as a bonus, the boys are building massive muscles every time they slide the bookcase door. It’s a beast! But even the 3-year-old can do it, the little hulk. So, what do you think? Does this inspire you to find creative ways to maximize the form and function of your space? My neighbor’s daughter has already requested a set of these doors for her room. I hope she gets ’em! Mary Lou on …And this is it!